When it is mango season, green mangoes rule the daily menu in most Keralan homes. They are used in many ways, made into chutneys, picked, salted, added to curries, (which I have a post about here! https://manjuskitchen.co.uk/2013/01/27/kerala-fish-curry-with-green-mangoes/) or made into a simple dish on its own like this mango curry. 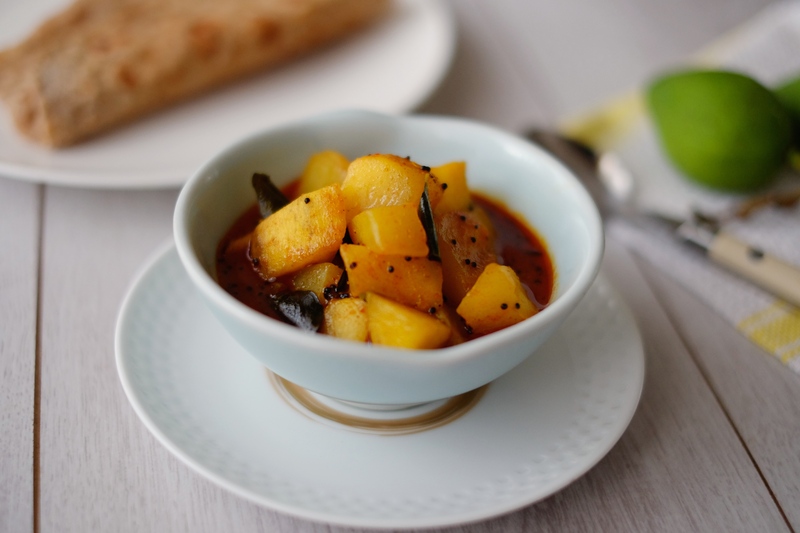 There are different variations of mango curry served in Kerala, sometimes with fresh coconut or on its own with a combination of spices and aromatics. When the crunchy raw green mango pieces are cooked in the spicy sauce it turns into soft melting morsels and the tanginess mellows. That’s the beauty of this curry! It stays fresh in the fridge for a couple of days to a week so don’t be afraid to make a big batch if there are enough green mangoes available. Serve it with chappathi or rice as a side dish. I am enjoying a big batch of it at the moment! Heat oil in a sauce pan and fry mustard seeds until they pop. Add curry leaves, chopped garlic, sauté for a minute and then add the chilli powder, turmeric powder and asafoetida powder. Mix well and add 1/2 cup of water and salt. Boil the above sauce for a few minutes and then add the mango pieces, mix, cover and cook for 5- 10 minutes or until the mango is soft. Make sure you don’t over cook it or the pieces will starts to melt into the sauce. Leave the curry aside for an hour for the flavours to blend together before serving.